Do you have an emergency blocked drain? Of all plumbing emergencies, a blocked drain is the one that worries people the most. Your home’s sanitary drainage is rarely thought about yet it’s one of the most important systems in your house. A blocked or poorly constructed drain is not only an inconvenience; it has the potential to become a serious health hazard to you and your family. We’re available for your emergency gas problem 24 hours, 7days a week. If your toilet or sink is backing up, or your backyard is flooding when it rains, we can help. We have the expertise and experience to get your drains unblocked and fully functional again. 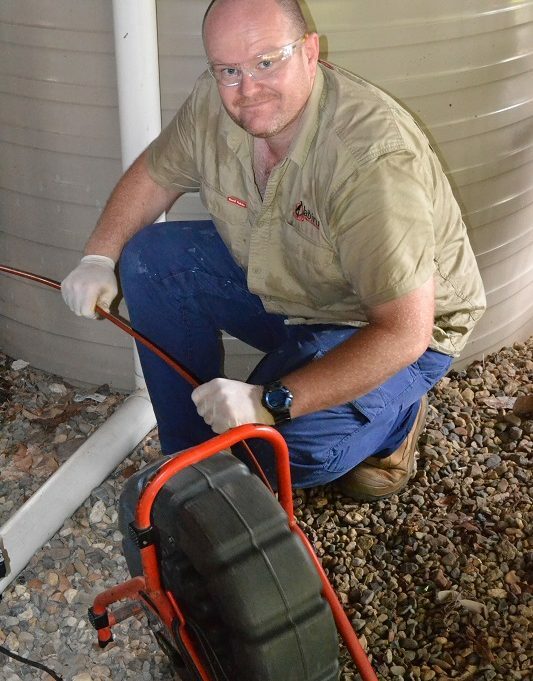 We service the entire Brisbane area. We can complete a CCTV drain camera inspection to determine what caused the blockage and we can also pinpoint the location of the problem using our pipe locator. This clever device receives a signal through the ground from our camera inside the pipe and allows us to accurately mark out where the issue is and how to access it with minimal disturbance to your house and garden. The other important consideration with a blocked drain is the clean-up afterwards. As you’d understand. blocked drains are a messy business and it’s important to clean up any mess or residue left behind and to sanitize and disinfect the area. You can trust that our plumbing work will be done with care and the site will be left clean and tidy. Call today to get your drains flowing again! There are many reasons a drain might block. These might include a broken or sunken pipe, a foreign object stuck in the drain, tree root ingress or even a build-up of grease or kitchen waste. Using a variety of equipment to clear the blockage, our goal is simply to get your drains flowing again and fast! Digging up large sections of your property to find blocked drain causes is a thing of the past. We use the latest technology in plumbing inspection equipment, including a CCTV Drain Camera, to locate the exact location of the blocked drain and work out the best solution to fix it.